The roots of America’s love affair with Jeep® can be traced to World War II, as the one-of-a-kind vehicle dutifully served the U.S. military with its durability and ruggedness. The affinity for Jeep gained traction as the first civilian Jeep (“CJ”) vehicles – the Willys-Overland CJ-2A – reached the public in 1945. The CJ-2A, and successor CJ-3A, was immortalized for its go-anywhere capability and strictly functional amenities. Based on the Wrangler Sport model, the Willys Wheeler Edition features upgraded hardware, including a Dana 44 rear axle with Trac-Lok® limited-slip rear differential and 3.73 gears, BF Goodrich KM Mud Terrain LT255/75R17 tires, rock rails and a new Jeep Trail Rated Kit that includes a D-Ring, tow strap and gloves in a Jeep-branded bag. This works with the Jeep Command-Trac 4×4 part-time, two-speed transfer case with a 2.72:1 low-range gear ratio to give the Jeep Wrangler Willys Wheeler Edition its improved off-road chops. Special exterior design cues include a gloss black grille with black Jeep badge, gloss black front and rear bumper appliques, historic satin black “4 Wheel Drive” rear tailgate decal and “Willys” hood decals and unique high-gloss black 17-inch aluminum wheels. The Willys Wheeler Edition comes standard with a Sunrider soft top and deep-tint sunscreen rear windows. A premium Sunrider soft top and black-splatter Freedom Top are available. The 2014 Jeep Wrangler Willys Wheeler Edition features the award winning 3.6-liter Pentastar V-6 engine that produces 285 horsepower and 260 ft.-lbs. or torque. It is available with a standard six-speed manual or an available five-speed automatic transmission, and delivers up to 21 miles per gallon on the highway. Available in any Jeep Wrangler color, the Willys Wheeler Edition has a Manufacturer’s Suggested Retail price (MSRP) of $25,795 for two-door models and $29,595 for Unlimited (four-door) models. The 2014 Jeep Wrangler and Jeep Wrangler Unlimited are built at the Toledo Supplier Park in Toledo, Ohio. As the nation paused this Memorial Day to remember those who served in the United States Armed Services, Chrysler Group’s Toledo Assembly Complex (TAC) unveiled its own special tribute to veterans around the country. Vice President of Assembly Operations Zach Leroux, TAC Plant Manager Chuck Padden, UAW Local 12 Chairman Mark Epley, employees and five veterans with ties to the Toledo plant, including three retirees who served in WWII, dedicated a permanent veteran’s memorial in the shadow of the giant Jeep® sign that identifies the plant at the intersection of I-75 and I-280. Featuring a restored 1942 Willys Military Jeep, the memorial not only recognizes the service of those in uniform, but also the plant’s nearly 75-year history of building Jeep vehicles, starting with production of the first military Jeep. “Like all Americans, we owe our freedom to the sacrifices made by the men and women who serve in the military, but at Jeep, we owe our very existence to our WWII veterans,” said Padden. “When they returned home from the war, they purchased civilian versions of the Jeep vehicles they learned to depend upon in the war. These heroes became our first Jeep enthusiasts. Without them, we would not be here today. Plant management and the local UAW leadership agreed that the best way to honor veterans and the plant’s Jeep history was to find a military Jeep to restore and put on permanent display. With the help of former Toledo plant manager Jerry Huber and a Craig’s List ad, the 1942 Willys was found in Wimberley, Texas, a community 28 miles southwest of Austin. The vehicle was in fairly good shape, but didn’t run. When the owner heard that the Jeep plant in Toledo wanted the vehicle to put on display, he immediately pulled the ad, sold it to the plant for $950 and volunteered to transport it to Toledo in exchange for a tour. The Willys returned home on May 9 and restoration work began on May 12. A team of about 15 Toledo employees worked for a week and a half to return the vehicle to its original condition, replacing parts, refurbishing body panels and painting the vehicle. Because all of the vehicle identification plates and hood graphics were removed, the exact history of the vehicle can’t be determined, but the plant estimates that the vehicle was originally built in mid-1942. The memorial also includes silhouettes of soldiers, created by volunteers from the plant. An assembly employee drew up the soldier outlines and body shop employees cut out the figures, ground the edges and finished them. Helping to dedicate the Toledo Assembly Complex’s Veteran’s Memorial were five veterans, all of whom with ties to the plant.Lupe Flores, the 90-year-old cousin of Jeep retiree Hector Flores who serves on the Jeep Veterans Committee, served with the Army 101st Airborne from 1943-1946. Flores was involved in the D-Day Invasion in Normandy, France, and took part in two combat jumps during his time with the Army. Twins Lewis and Leroy Woggon, 87, were hired by the Jeep plant in 1943. Three months later, they were drafted into the Army and served as combat engineers during WWII. They both served for three years, returning to work at the Jeep plant after they were discharged. Leroy retired in 1989 after 45 years with Jeep, while Lewis stayed on five more years, retiring in 1994. Leroy’s son Gary has been working at Jeep since 1983 and currently works in the Wrangler paint shop. Lewis’s son and grandson both retired from the Jeep plant. Ron Szymanski retired from the Jeep plant in 1998 following 35 years working in body, paint and assembly. He also served as the Jeep museum curator. Szymanski served in the Army National Guard from 1950-1955, then went to Officer Candidate School where he was Honorably Discharged in 1960 as a 1st Lieutenant Army Reserve Officer. John Smith served in the Army Infantry from 1945-1946. Smith was hired by Jeep in 1947 and spent the next 40 years building Jeep vehicles before retiring in 1985. Toledo is known as the birthplace of Jeep. In 1940 as war spread through Europe, the United States Army determined that it needed a new type of fast, lightweight, all-terrain reconnaissance vehicle. The Army selected Toledo-based Willys-Overland for production of the vehicle, and the company began production in late 1941, building about 8,000 units that year. In total, 363,000 were built in Toledo through the end of the war in 1945. The Jeep was an all-purpose vehicle and served in every theater of the war. It was used as a staff car, pickup truck, ambulance, reconnaissance vehicle, machine gun mount, ammunition bearer and a troop carrier. After the war, Willys-Overland introduced a version for the general public, adding refined features such as windshield wipers, a tailgate and an outside gas cap. It was called the CJ-2A, with the “CJ” standing for “Civilian Jeep.” It became an icon because of its open-air look and tremendous off-road capabilities. Other Jeep models followed, such as the first station wagon with four-wheel drive, and the Wagoneer, a pioneering sport-utility vehicle introduced in 1963. They were also built in Toledo. Meanwhile, Jeep’s corporate ownership changed hands several times until Chrysler acquired the brand in 1987. Today, the Toledo Assembly Complex builds the Jeep Wrangler, Jeep Wrangler Unlimited and the all-new Jeep Cherokee with nearly 4,200 employees. The Jeep brand is creating an interactive time line of Jeep owners. Here’s how you can be a part of it. Submit a photo of your Jeep vehicle, along with the model year, and it will be added to the time line and posted on Facebook™. If you’re lucky, your photo could appear in a coffee table book version of the time line and Jeep will send you a copy. Click here to Get On The Time Line. Durango. Burgundy. It’s Kind of a Big Deal. If you haven’t yet seen the new spots, you are in for a treat. If you haven’t seen them all, you’ll be in for a laugh for some time to come. 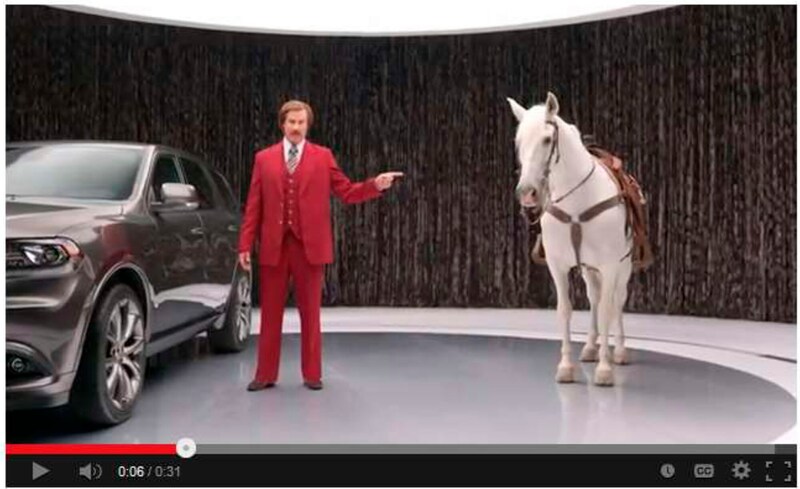 There are 70 different spots featuring Will Ferrell as Ron Burgundy, starring as the pitchman of the new 2014 Dodge Durango. 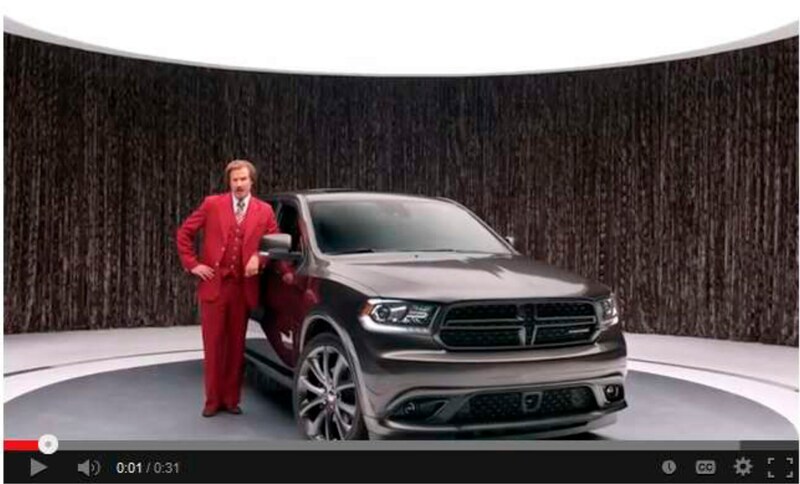 The humor lies in the fact that Ferrell delivers the pitch in the character of Ron Burgundy, an arrogant anchorman straight out of the 1970s, which means he has a bit of a different take on the many features of the Dodge Durango. In one spot, Burgundy completely ignores the advanced technology of the 2014 Dodge Durango and instead concentrates on what fits nicely in the glove box. Seventy spots may sound like a lot, but with a talented actor and comedian behind the wheel, the ads rolled off Ferrell’s tongue totally unscripted and ad-libbed. That’s a lot of content and a lot of humor. The spots will air through the end of the year. The movie arrives in theaters Dec. 20. The 2014 Dodge Durango is in showrooms now. When it comes to a unique and effective advertising campaign, you have to admit, it’s kind of a big deal. April 26, 2013 , Auburn Hills, Mich. – Chrysler Group LLC announced today that it will invest $19.6 million in its Toledo Machining Plant in Perrysburg, Ohio, to increase capacity of the torque converter it’s machining for the nine-speed transmission. With this announcement, the Company’s total investments in its U.S. operations since June 2009 increase to over $5.2 billion. The new torque converters will be paired with the next generation, fuel efficient nine-speed front-wheel drive transmission being assembled at Chrysler Group’s Indiana (Kokomo, Ind.) Transmission Plant I. The new transmission will debut in the 2014 Jeep® Cherokee. The investment will fund the installation of new equipment and tooling for additional machining and assembly capacity. Installation is expected to begin in the third quarter of 2014 and will be completed by the end of 2014. In August 2011, a $72 million investment in Toledo Machining was announced to modernize the plant to produce the eight- and nine-speed torque converters on two new production lines and a new steering column for the Dodge Dart and Jeep Cherokee. These installations will be complete in the third quarter this year. In February, the Company announced that it was investing $374 million in several of its Kokomo, Ind., facilities, including establishing a new manufacturing site in Tipton, Ind., to increase production capacity of the nine-speed transmission. Chrysler Group LLC Chief Executive Segio Marchionne announced that the auto maker “intends to break even” on an operating basis this year and will hit its target of selling 1.1 million new vehicles in the U.S. He is confident that Chrysler will meet their “ambitious but achievable goals.” Mr. Marchionne said during a keynote address at the Automotive Forum 2010 in New York Tuesday. “The amount of work that had been done to bring down the break-even point—that number ended up being lower than most people thought.” He added that “to the extent that we are producing cash…I feel a lot more comfortable today than I did 12 months ago.” As of Monday the company has stockpiled a just over $5 billion in cash. Mr. Marchionne also stated that the auto maker will invest $500 million in Chrysler’s U.S. dealership network over the next five years.